Hot on the heels of my previous collaboration with Dr Staffan Qvist (from Uppsala University) on the implications of phasing out nuclear energy in Sweden, I’ve just had published another new open access paper on energy policy, this time in the peer-reviewed journal PLoS ONE. You can read it in full here. Swedish total CO2 emissions and GDP per capita 1960–1990, normalized to the level of 1960. There is an ongoing debate about the deployment rates and composition of alternative energy plans that could feasibly displace fossil fuels globally by mid-century, as required to avoid the more extreme impacts of climate change. Here we demonstrate the potential for a large-scale expansion of global nuclear power to replace fossil-fuel electricity production, based on empirical data from the Swedish and French light water reactor programs of the 1960s to 1990s. 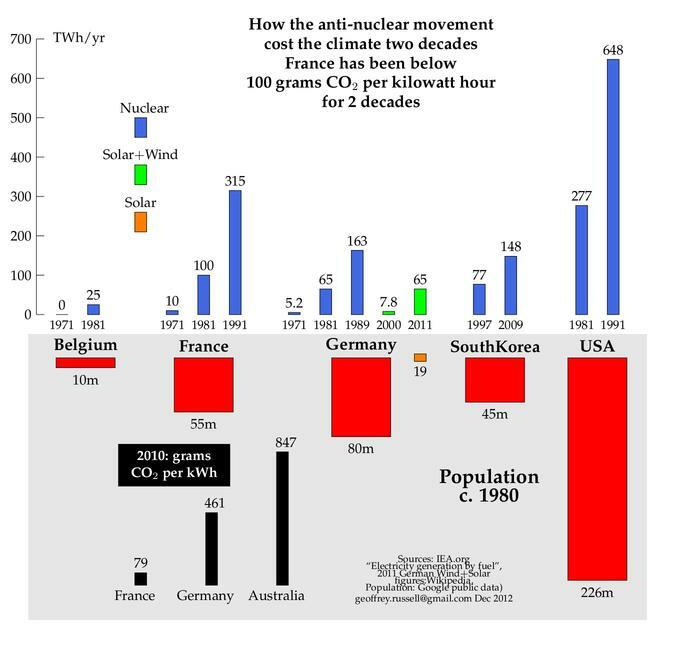 Analysis of these historical deployments show that if the world built nuclear power at no more than the per capita rate of these exemplar nations during their national expansion, then coal- and gas-fired electricity could be replaced worldwide in less than a decade. Under more conservative projections that take into account probable constraints and uncertainties such as differing relative economic output across regions, current and past unit construction time and costs, future electricity demand growth forecasts and the retiring of existing aging nuclear plants, our modelling estimates that the global share of fossil-fuel-derived electricity could be replaced within 25–34 years. This would allow the world to meet the most stringent greenhouse-gas mitigation targets. The key finding is that even a cautious extrapolation of real historic data of regional nuclear power expansion programs to a global scale, as shown in the table below, indicate that new nuclear power could replace all fossil-fuelled electricity production (including replacing all current nuclear electricity as well as the projected rise in total electricity demand) in about three decades—that is, well before mid-century, if started soon. This complements earlier top-down work I’d published on 2060 scenarios. Time to replace global fossil electricity and current nuclear fleet. The methods of the paper are explained in detail, and I’d be happy to debate our assumptions. Clearly, any climate change mitigation strategy will, due to the magnitude of the challenge, inevitably be based on extrapolation of existing data and assumptions about the future. This is true whether the technologies to displace the use of fossil fuel will be based on nuclear fission, fusion, wind, solar, waves, geothermal, biomass, pumped-hydro, energy efficiency, smart grids, electric cars or other technologies and any combination of the above. No renewable energy technology or energy efficiency approach has ever been implemented on a scale or pace which has resulted in the magnitude of reductions in CO2-emissions that is strictly required and implied in any climate change mitigation study—neither locally nor globally, normalized by population or GDP or any other normalisation parameter. The goal of this paper is to make an extrapolation of actual available historic data from regional expansions of a low GHG-emitting energy technology, rather than trying to speculate further on future potential deployment strategies, as has commonly been done in the literature. Our results indicate that a replacement of current fossil-fuel electricity by nuclear fission at a pace which might limit the more severe effects of climate change is technologically and industrially possible—whether this will in fact happen depends primarily on political will, strategic economic planning, and public acceptance. I think this is a genuinely exciting finding—yes we can! Even if we were to get rid of all gas, oil and coal burning power, we still need some high-intensity electricity production to power activities such as smelters, foundries and manufacturing. Nuclear power dedicated to serving a nearby comprehensive industrial area is almost a necessity, because grids absorb a lot of power themselves. Solar and other forms of renewable energy can service the more distributed needs, so that there need be no conflict or competition between these power sources. Please read the BNC Comments policy before commenting further. In particular please supply quality refs and peer reviewed links to support your assertions. Thank you. Just have to say that the last graph actually confuses me. It simply does not clearly show what the title says. Would it not make more sense to put the Co2 per Kwh next to energy generated? This would show Germany going up, which I think is the point. Yep, renewables and nuclear are complimentary. For renewable deployments, load-following small modular reactor installations can be used instead of gas-fired power plants for the necessary backup. And yes, some kind of backup is required for intermittent renewables. I got a similar conclusion out of a very quick-and-dirty calculation regarding Nuscale reactors. Nuscale says their unit (reactor and containment) will weigh 700 tons and produce 47.5 MW(e) (plus another ~112 MW(th) of heat). By my calculation, producing 2 Nuscale units per day, 250 days per year, would be a fraction of the sold tonnage of the auto industry in the USA. 500 units per year would be 23.75 GW(e), or enough to replace total US generation from coal in roughly a decade. Replacing natural gas base-load would take a few years more, and if I was making policy I’d push into displacing NG by cultivating demand-side managed dump loads such as water heaters and overnight EV charging. This is a spectacular result, which gets even more so when you consider the heat output. Entire cities could be heated by steam from these units. By my calculation the value of the steam would be a significant fraction of the total production of the reactor. The small size of the Nuscale unit might allow the emergency planning zone to be limited to the reactor building itself, allowing units to be placed inside cities where the heat can be easily sent to consumers and yielding cities where no carbon is emitted for electric generation, space heat or DHW. Electrify the vehicle fleet and decarbonization would be nearly complete. Yes we can INDEED Barry and what a huge role South Australia could/should/will play once Kevin Scarce’s Royal Commission comes out with firm recommendations for the development of more, preferably all, of the nuclear fuel cycle here in SA. That’s what I’ve been advocating since 2009 [see my opinion piece in the Adelaide Review, Sept 2009]. And my vision, now twelve years old, sits very nicely with your 25-34 year programme of replacing fossil fuels with emissions-free technologies, especially nuclear. We should limit further growth in the renewables, especially wind as they have proved around the world to be a scandalous, wasteful folly with terrible consequences in the UK, Germany and Denmark. And we shouldn’t get too excited about solar thermal as well. We should also note Barry, that the current expansion in nuclear build around the world has already given your idea a good start. As of April 2015, according to the WNA newsetter there are 65 reactors under construction now, 165 have been firmly planned and 331 are proposed for the future. If that all comes to fruition in the next 25 -30 years, as it should, we could well have replaced all fossil fuel generation around the world by that time. As you know Barry, I’ve been promoting nuclear power for Australia for 17 years and way before you and I met at the SA Museum a few years ago.Needless to say, I shall be presenting a submission to the RC. At 77 Barry, I’m pleased that we’re at last going to look at the nuclear issue. My old nuclear buddies from ANSTO, Lucas Heights etc who fed me a lot of info and some of whom have now departed this life are as delighted as I am that at last, it’s on. But, it needs to be expedited and we must NOT let the anti nuclear ideologues divert us from the nuclear path as they did thirty years ago. Their opposition to nuclear has cost the world dearly. If you haven’t already done so Barry, you could usefully log onto http://www.abc.net.au/rn/ockhamsrazor, bring up past programmes and check those for Sept4th 2011, Jan 15th 2012, March 10th 2013 and Feb 9th 2014. Together they represent my effort to educate the people to the truth about nuclear power. Others who read this blog should do the same. When focussing on supply-side choices there are many ups and downs. At the end of the day we make the choices then live with the consequences. The main point is that it is metal rather than oxide.